Immunoglobulins (antibodies) form a key arm of our adaptive immune system that is central to protection against infectious disease. 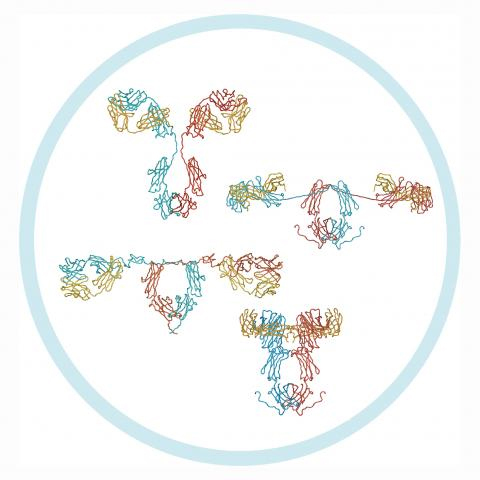 The focus of our laboratory is structure-function relationships in immunoglobulins (Ig), with a particular emphasis on IgA, IgG and IgE. Antibodies perform a dual role in immunity. They both recognise the foreign invader (e.g. virus or bacterium) and trigger its elimination. The elimination processes commonly result from the interaction of Igs with effector molecules, such as Fc receptors on phagocytes. We aim to develop an understanding of precisely how Igs mediate their protective functions. IgA, the chief antibody in secretions that bathe mucosal sites such as the linings of the gut, lungs, genitourinary tract, and oral cavity, serves as one of the body’s key first lines of defence against invading microorganisms. IgG, as the main antibody in serum, plays a central role in immunity to viruses and bacteria that have breached the body's external defences. IgE offers protection against certain parasites, but is also associated with the allergic response seen in common diseases such as asthma, hayfever and eczema. Using a genetic engineering approach we are working to define, in molecular terms, how Igs interact with a number of important molecules including receptors on immune and epithelial cells, Ig-specific proteases secreted by pathogenic bacteria, and Ig-specific binding proteins which some bacteria produce as a means to circumvent the immune response. Our interests extend to Igs from various species including humans, cattle, and horses. Igs display surprising differences between species, necessitating study of the unique complement of Igs present in each species in order to understand their particular structural and functional characteristics. Other interests in the lab include the development of novel monoclonal antibody reagents for treatment of certain cancers and infections such as tuberculosis. Monoclonal antibodies are now recognised as highly effective therapeutics, and next generation antibody reagents will target a wider range of diseases and exhibit enhanced efficacy. BSc Life Sciences, Level 4. BS42006 Advanced Immunology module. Module manager. Deliver lectures, tutorials, and workshop. BSc Life Sciences, Level 3. BS32009 Immunology Module. Module manager. Deliver lectures and workshops. BSc Life Sciences, Level 2. BS22002 Biological Sciences module. Deliver lectures and workshops. BSc Life Sciences, Level 1. BS12005 Science and Society module. Deliver lectures. BDS, Level 2. Immunology module. Module manager. Deliver lectures and tutorial. MRes Cancer Biology. Deliver lectures. Advisor of Studies, Levels 1-5. 2016 Highly Commended, School Teaching Awards for Good Practice, School of Life Sciences, University of Dundee. “Rubrics in Honours project assessment: valuable aids to enhance student preparedness and promote consistency of marking”, With S Land and D Booth. Woof J.M. (2016) Immunoglobulins and their receptors, and subversion of their protective roles by bacterial pathogens. Biochem Soc Trans. 44, 1651-1658. Spoerry C., Hessle P., Lewis M.J., Paton L., Woof J.M. and von Pawel-Rammingen U. (2016) Novel IgG-degrading enzymes of the IgdE protease family link substrate specificity to host tropism of Streptococcus species. PLoS One 11:e0164809. van Egmond M., Bakema J.E. and Woof J.M. 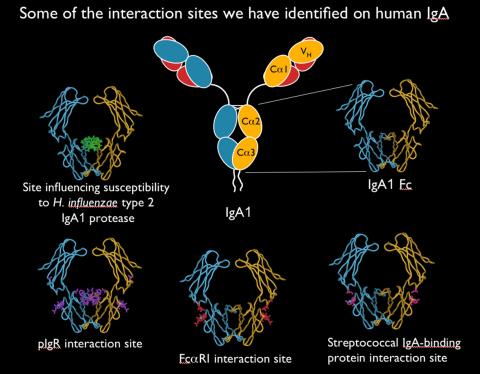 (2015) Immunoglobulin Fc receptors. In Mucosal Immunology, 4th Edition. Edited by J.R. Mestecky, W. Strober, M.W. Russell, H. Cheroute, B.N. Lambrecht, and B. Kelsall. Academic Press/Elsevier Ltd. Chapter 20, p409-428. Mestecky J. and Woof J.M. (2015) Mucosal immunoglobulins. In Mucosal Immunology, 4th edition. Edited by J.R. Mestecky, W. Strober, M.W. Russell, H. Cheroute, B.N. Lambrecht, and B. Kelsall. Academic Press/Elsevier Ltd. Chapter 17, p287-324. Pinheiro A., Woof J.M., Almeida T., Abrantes J., Alves P.C., Gortázar C. and Esteves P.J. (2014) Leporid immunoglobulin G shows evidence of strong selective pressure on the hinge and CH3 domains. Open Biol. 4(9):140088. Pinheiro A., Woof J.M., Abi-Rached L., Parham P. and Esteves P.J. (2013) Computational analyses of an evolutionary arms race between mammalian immunity mediated by immunoglobulin A and its subversion by bacterial pathogens. PLoS One 8, e73934. Woof J.M. (2013) Immunoglobulin A: Molecular Mechanisms of Function and Role in Immune Defence. In Molecular and Cellular Mechanisms of Antibody Activity. Springer, New York. Edited by F. Nimmerjahn. Chapter 2, p31- 60. Kaetzel C.S., Mestecky J. and Woof J.M. (2013) Secretory immunoglobulins and their transport. In Principles of Mucosal Immunology. Garland Science, New York and London. Chapter 9, p121-140. Woof J.M. and Russell M.W. (2011) Structure and function relationships in IgA. Mucosal Immunol. 4, 590-597. Balu S., Reljic R., Lewis M.J., Pleass R.J., McIntosh R., van Kooten C., van Egmond M., Challacombe S., Woof J.M. and Ivanyi J. (2011) A novel human IgA monoclonal antibody protects against tuberculosis. J. Immunol. 186, 3113-3119. Lewis M. J., Wagner B., Irvine R., Woof J.M. (2010) IgA in the horse: cloning of equine polymeric Ig receptor and J chain and characterisation of recombinant forms of equine IgA. Mucosal Immunol. 3, 610-621. 2015 Incredible Immunology: a stand on antibodies and blood group types as part of a public engagement event delivered to school groups and the general public at the Dundee Science Centre and University of Dundee. 2014 Beautiful Biology: organised an exhibition of scientific research images exhibited in Dundee Science Centre as part of the Dundee Science Festival. 2013 Visions of Discovery: organised an exhibition of scientific and medical images in Dalhousie Building, University of Dundee. The images were also exhibited in summer 2014 at the 72nd World Science Fiction Convention in the ExCeL London Exhibition Centre, which attracted ~8000 visitors over 5 days. 2013 Meet the Researcher Showcase: talk on my research career path at an event organised by Medical Research Scotland at the University of Abertay, attended by senior pupils and teachers from local secondary schools.